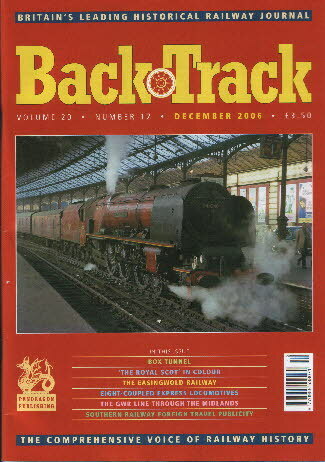 Railway Magazine | BackTrack Dec 2006 journal from Pendragon Publishing. One Sunday in August - colour photos of the '15 Guinea Special, British Rail's last steam train in August 1968. The Christmas Eve Derailment - Alistair F. Nisbet writes about a GWR derailment at Shipton-on-Cherwell in 1874. Tunnels, Electrics and Economics - R.A.S. Hennessey looks at early railway tunnel electrification. Express Eight-Coupled - Some notes on the Gresley 2-8-2 and Chapelon 4-8-0 by Michael Rutherford. Riding the 'Royal Scot' - colour feature on this famous London-Glasgow train. Through the Midlands by Great Western - colour feature by Michael Mensing. Box of Puzzles - Philip Atkins tries to shed some light on the legend of the sunrise shining through Box Tunnel on Brunel's birthday. Off the Beaten Track - Alan Bennett explores how the Southern Railway catered for the more adventurous foreign travellers of the 1930s. The Class 33 'Cromptons' - colour photographs of the BRCW Southern Region Type 3 diesels. The Parcels Office - Arthur R. Nicholls looks at the work of a vanished railway department. The Easingwold Thunderbolt - a brief history of the independent Easingwold Railway in the North Riding of Yorkshire by Michael Blakemore. LNER Non-Passenger Miscellany - 3 colour photos of bogie pigeon van, covered carriage truck and six-wheel brake.